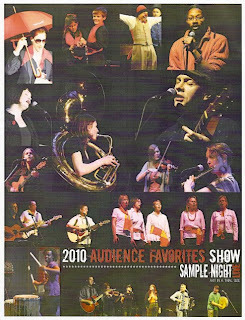 “Art in a trial size.” That’s the motto for Sample Night Live, which is held the first Wednesday of every month at the History Theatre in downtown St. Paul. 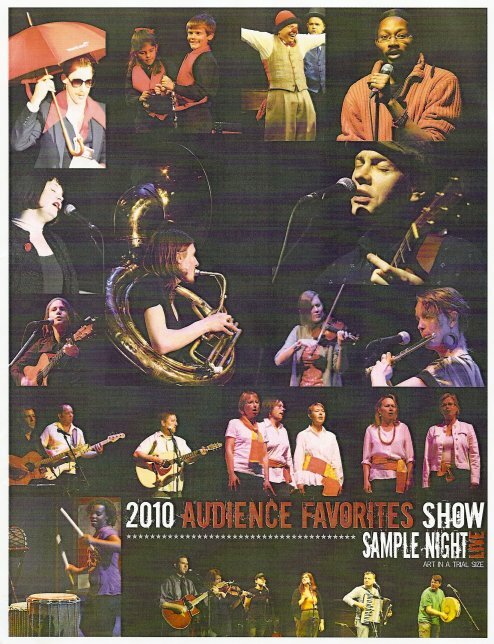 It allows audience members to sample the work of local artists in one evening for one low price. Visual artists display their work in the lobby, and about a dozen performing artists take part in the evening’s program. Last night was the “Audience Favorites Show” – the audience votes on their favorite performance every month and the winners are invited back for the December show. Sample Night Live is hosted by Lounge-asaurus Rex (aka Tom Reed), a singer/comedian/emcee in a 70s lounge-singer suit, complete with mustache and big sunglasses. He's a funny and entertaining host, informing the audience about the performers and providing "seamless transitions" between acts. He made up several songs on the spot; I think my favorite was "Code Monkey." Accompanying him and several of the musicians was the house band, The Smarts. They played before the show and during intermission; last night they did a collection of jazzy Holiday standards and originals. They play an impressive number of instruments for just four men! The first act also included a trio of children's act, and the kids in the audience enjoyed them, as did I. First was a band called Funkasaurus-Rex (no relation to Lounge-asaurus) consisting of a tuba, trumpet, bass guitar, and drums. The band is part of the Perpich Center for Arts Education and played a medley of songs while entertaining the crowd. The magicians from Dew Dah Magic also performed - a magician and his two adorable kids who performed Houdini's Metamorphosis trick. The final kids' act was my favorite - two clowns from Theatre of Fools, aka "Vaudeville for the 21st Century." They did a few tricks and managed to communicate and entertain without saying a word. Three musical acts rounded out the first half of the show. Greg Herriges plays guitar and other instruments in a style he calls "world/whirled music." He won audience favorite of the night, and hence, the year. I don't disagree with the choice; he's very talented. The other two acts were Scandinavian music ensembles. The five-person Saana Ensemble sings traditional Finnish music (the members are originally from Finland), and the duo Kaivama, Sara Pajunen on fiddle and Jonathan Rundman guitar/harmonium, performs traditional and original Nordic tunes. Both groups made beautiful music. After intermission, Act II began with a presentation from MNTV, which airs short films from Minnesota filmmakers on public television. I recognized a few local actors in some of the clips. Eighteen films will be shown, beginning on December 12 on TPT2 (check your local listings). The rest of the performers were musicians with one exception - the poet Khary Jackson aka 6 is 9. I don't know anything about poetry slams or the art of spoken word, but it was pretty cool. The Artists' Quarter in St. Paul hosts a poetry slam every Monday night; I might have to check it out sometime. The first musician of the second act was the jazzy cool Christine Rosholt. Accompanied by The Smarts, she sang a few Holiday songs including one of my favorites, "Baby it's Cold Outside." She has a strong and beautiful voice and a cool style. Julie Johnson and the No-Accounts are a folk trio consisting of Julie Johnson on flute/bass flute, Doug Otto on vocals/guitar, and Drew Druckrey on guitar/resonator guitar/vocals/mandolin. Their current focus is on roots music from right here in Minnesota. As a lover of folk music and Minnesota, I think this is a pretty cool thing! According to their website, the "first full recording of composition/songs based on Minnesota folk music" comes out next year, and I'll be watching for it. How can I describe The Dregs? I'll let them do it: "Ireland's shame and a menace to sobriety, The Dregs are a band of Scandinavian-Irish posers who bring their own merry flavor of folk music to the pubs and taverns of Minnesota. With staggering behavior, these six sorry sots perform intoxicating ballads, lush anthems, and sea shanties that'll have you three sheets to the wind! So pour yourself a cold one, and get ready for a stomping, clapping, spitting, swearing, mug-swinging, good time!" They're a lot of fun, and would probably be even more fun after a pint or two of Guinness. The final act of the evening was a folk singer/songwriter that seemed to step right out of the 60s, Heatherlyn. She played a couple of originals inspired by Martin Luther King Jr., accompanied by The Smarts. I really enjoyed my first experience at Sample Night Live and will definitely be going back. I would like to see more theater samples, because that's my thing (obviously). It's impossible to get to all of the many wonderful theaters in the Twin Cities (although I do my best), so it would be nice to get a taste and see which ones I want to see more of. I'll be keeping an eye on their website (you can also follow them on facebook) to see what I can sample next. Anything that supports the community of artists in this town is OK by me.